The object of 'The Friends' is to raise funds for the preservation and maintenance of the fabric of St. Margaret's Church and churchyard. St. Margaret’s is a Grade 1 listed building and all repairs and maintenance have to be carried out to very high specifications and overseen by English Heritage. This inevitably increases the costs but ensures that the building is kept in the best possible condition in keeping with its age. This event at Hobbs Barton was given by kind permission of Valerie and Jeremy Clark. 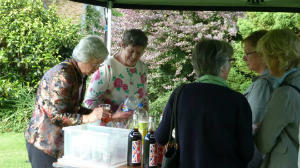 Guests paid to take a walk around the beautiful gardens, with a glass of Pimms. 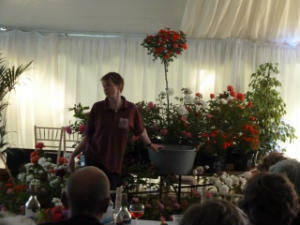 We then enjoyed wine and ‘nibbles’, and were able to listen to a talk and demonstration of the history and care of roses from Sally Moon, from Wych Cross Garden Centre. We were blest with fine weather. I understand that a sum in the region of £1100 was raised for "The Friends". The Friends was established as a registered charity in 1981 when major repairs were needed urgently and an appeal to raise £30,000 was launched. Since 1981, The Friends have raised over £300,000. The Friends reach out to a wider community than the church congregation and also can apply for grants from various other bodies such as the Historic Buildings and Monuments Commission for England. All money raised by The Friends is spent directly on St. Margaret's Church and churchyard. The Friends raise funds by regular contributions and legacies from Friends, by donations from visitors to the church and various events through the year. 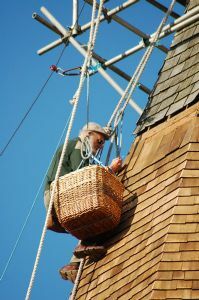 The most recent major project funded by The Friends was the reshingling of St. Margaret's Church spire in 2008/9 by A E Hughes and Sons of Leatherhead, at a cost of some £30,000. Over 9,000 new cedar shingles were required, many of which were sponsored by people who signed their names on the shingles, which will hopefully not need replacing until the second half of the 21st century. The picture on the right shows Mr Peter Harknett hard at work on the spire at the height of some 80 feet (c. 25 metres), suspended in a bosun's chair at the tender age of 75! The Trustees attempt to maintain sufficient reserves to ensure that the PCC can take prompt action on any necessary repairs, thus preventing deterioration in the condition of this beautiful church. Have the satisfaction of knowing that you are helping to maintain this beautiful and ancient church, which brings peace and joy to people from far and wide and may well have a special meaning for you. Receive a copy of the latest newsletter as a thank you for your donation. Receive a newsletter each year to keep you up to date with the work of The Friends. 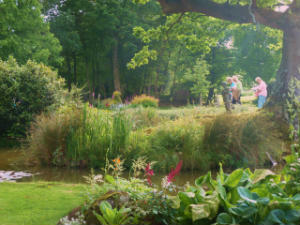 Be welcome to join in any of our social events, which include suppers, bridge afternoons, golf matches, open gardens, sponsored cycle rides, Christmas Fairs etc. To join The Friends, just email your name(s) and address to Sally Jackson who will send you further details.